Come and enjoy our little piece of paradise in Rarotonga by the beach!! Upstairs sleeps up to 12 persons, 4 bedrooms and 2 bathrooms ... $320 for the first two persons, $40 each extra adult, $20 each child (2-11yrs), per night. Downstairs are two self contained units, for those groups that need a little more space, they sleep up to 4 in each ... $160 for the first two persons, $40 each extra adult, $20 each child (2-11 yrs), per night. So in total the house can sleep up to 20 persons. Minimum 5 night stay and minimum 4 person stay. About 25m walk across grass to the beautiful beach and lagoon with crystal clear water, ideal for swimming, snorkelling, kayaking ... or just lying on the sand! Smoking is permitted only outside. Guests are required to be quiet by 11pm to be considerate of the neighbours. 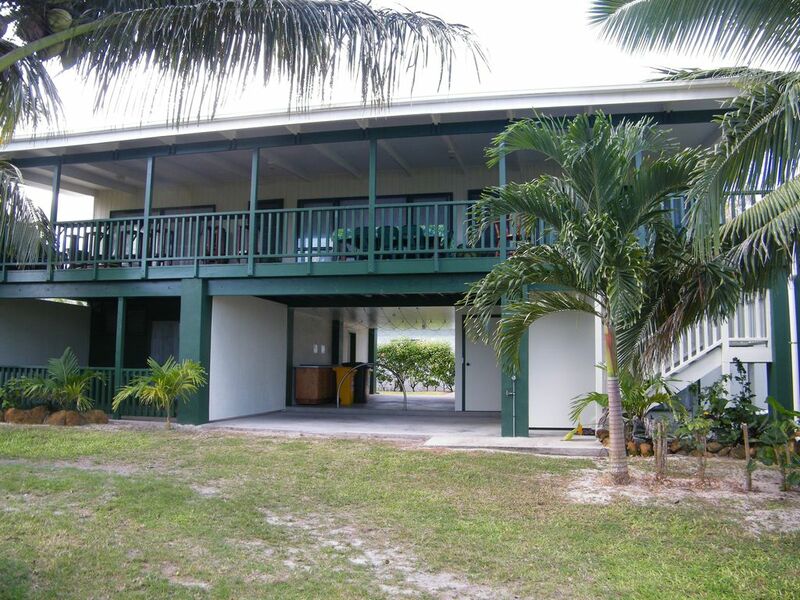 Spacious verandah for outdoor living looking out at the sparkling lagoon and ocean! Baby equipment is for hire ... carseat, high chairs, portable cots and buggy. Wifi is available at a cost. There is a dining area on the verandah and inside. Children's highchairs are available for hire. Car seat and buggy available for hire for children.